This handlebar bag use polyester as the main fabric and inner lining has friction resistance. It is very convenient as it storage bike in the bag, and fixed to the bicycle in a variety of ways, as well as to be carried with your car. inner lining has friction resistance. With a shoulder strap, you can carry it in your hand or carry it on your back. Suitable for 14-20 inch folding bicycle, overall generous and concise with fine work. 1.PROTECT BIKE: The bag can be put in the car to avoid the collision between the bike and the car and to make the car trunk cleaner. 2.QUALITY MATERIAL: This handlebar bag use polyester as the main fabric which is high strength, high tensile strength, and its' inner lining has friction resistance. 3.PORTABLE DESIGN: With a shoulder strap, you can carry it in your hand or carry it on your back. Suitable for 14-20 inch folding bicycle, overall generous and concise with fine work. 4.EASY TO USE: It is very convenient as it storage bike in the bag, and fixed to the bicycle in a variety of ways, as well as to be carried with your car. Only one Bike Storage Bag and one Small Storage Bag in all, other items are just props for photography, they are not included in the list. PROTECT BIKE: The bag can be put in the car to avoid the collision between the bike and the car and to make the car trunk cleaner. 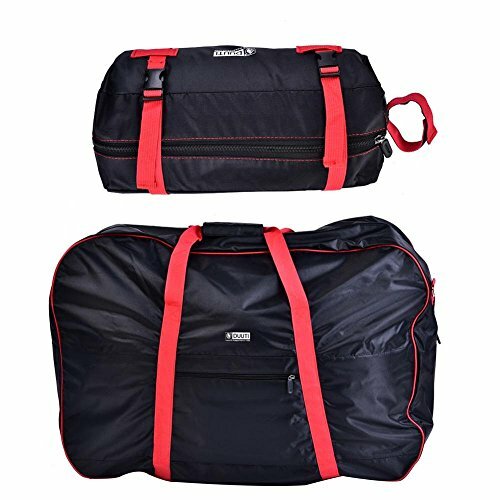 QUALITY MATERIAL: This handlebar bag use polyester as the main fabric which is high strength, high tensile strength, and its' inner lining has friction resistance. PORTABLE DESIGN: With a shoulder strap, you can carry it in your hand or carry it on your back. Suitable for 14-20 inch folding bicycle, overall generous and concise with fine work. EASY TO USE: It is very convenient as it storage bike in the bag, and fixed to the bicycle in a variety of ways, as well as to be carried with your car.